In a Venn diagram illustrating this assertion, the two circles would be completely overlapping (Diagram A. ), but this doesn’t square with the Biblical data. There are eleven NT instances of νουθετέω/νουθεσία. Five are descriptive.106 Six of these instances are prescriptive,107 and in several of these νουθετέω/νουθεσία is considered with other verbs, so there is no exegetical warrant for asserting that all counseling is simply nouthetic. Notice the emphasis on works as separate from and preceding honoring God: “By change we mean that counseling is done because there is something in another Christian’s life that fails to meet the biblical requirements and that, therefore, keeps him from honoring God.”108 Again, we have an exegetical problem. Note that Job was not guilty of sin, but ignorance.109 Further, we are told to reject a factious man after a first and second warning, knowing that such a man is perverted and is sinning, being self-condemned,110 whereas a wise man will hear and increase in learning, and a man of understanding will acquire wise counsel.111 In other words, it is the wise man who increases in learning, and his increase is not connected to the eradication of sin behaviors, but rather to a process of (transformative) learning. However, by throwing out the entire discipline of psychology, the consequence is that Christians have abandoned the study of the mind and the soul to those who deny the Creator. Christians have doomed an entire field of study to be populated by falsehood. Adams is to be commended for seeking a return to Biblical authority and sufficiency. He made great strides in drawing people to the Scriptures to find their solutions. However, as is the case in any reformation, there often remains the residue of the old and faulty, even as there is an attempt to refine. The intention here is not to castigate Adams, but rather to challenge us to refine, understanding the work Adams has done, deconstruct our understanding of psychology and counseling, and rebuild it not on B+t, but on B+Ø. Paul challenges the Colossians to be sure that no one takes them “captive through the philosophy and empty deception, according to the tradition of men, according to the elementary principles of the world, rather than according to Christ.”123 It is important to note that this is not a blanket condemnation of philosophy, but rather an indictment of the philosophy that is according to things other than Christ. It is that kind of philosophy that captures and enslaves. On the other hand, Paul is desiring that the Colossians would have a correct philosophy—one that is according to Christ. That philosophy is rooted in a proper mindset,124 and based on the doctrinal and practical elements discussed in Paul’s Letter to the Colossians, it could be described as a mental posture that effects the spirit, engages the will, and is manifested in conduct. In other words, Paul is advocating the right kind of philosophy, which we could say is the product of transformative learning, and we could add that Biblical counseling could play a significant role in that process, because of the content Paul provides to help us understand what Biblical counseling would look like. But Biblical counseling is a practical outworking—a prescriptive activity—based on descriptions found in the Bible. In a worldview context, the prescriptive requires a descriptive—there ought to be an is upon which the ought relies. That descriptive is can be understood as the Biblical teaching on metaphysics (the nature of reality) as it pertains to what a person is, what a person needs, and how a person can get what they need. This is within a subset of metaphysics called anthropology, and is a subset of anthropology, that we could call psychology—the study of the human soul or mind. It is that Biblical teaching on these aspects of personhood that should govern our prescriptions toward transformative teaching and learning. Now, some perceive psychology as a humanistic system of teaching that denies the Creator and operates from the vantage point that humanity is merely matter and energy. But that is not psychology. That would be a secular humanistic psychology. Psychology is itself a discipline—nothing more than a field of study. It is not a worldview. But in our times the discipline of psychology has been so overrun by the worldview of secular humanism, that it seems impossible to extricate the discipline from the philosophies that are not according to Christ. Our job is to understand where the content for an accurate psychology is derived. How we answer that question will determine the kind of counseling we will be doing, and from what vantage point. Psychology is not an extra-biblical resource. Psychology is simply the component within metaphysics that provides the is to ground the ought. The bases for the worldview (epistemology as well as other aspects of metaphysics) will ultimately predetermine the tenets of the psychology. Psychology is a discipline that is populated by the foundational principles of the worldview. Thus, while psychology is not a worldview, it is inextricable from the worldview that defines it. It is therefore incumbent upon counselors who seek to be Biblical to have a thoroughgoing Biblical psychology. From a B+Ø perspective, the tool needed for this type of transformative teaching/learning is clearly and simply Scripture. Paul is clear about the sufficiency of Scripture for the equipping of believers,125 and for the enlightening of unbelievers.126 Undoubtedly, there is no need for extra-biblical resources in either of these process, however, there is also no prohibition, and considering the examples experience, resources for sustenance, and helps employed beyond Scripture, we can see some advantage to the proper utilization of extra-biblical tools. 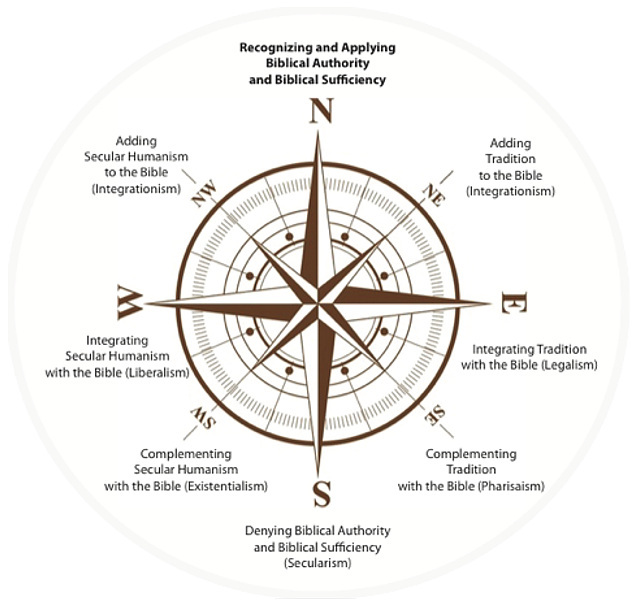 Experiences (in the form of illustration and remembrance, for example), tools of sustenance (including medical aids where needed), and helps beyond Scripture (potentially including models, and methods—including scientific—that are observed through the lens of Scripture) may be employed. Additionally, B+Ø provides modeling for assessment of when extra-biblical can be most helpfully engaged to complement Biblical content. Paul’s Acts 17 evangelistic episode in Athens records one such model. First, in 17:22-23 Paul shows familiarity with Greek culture and an ability to dialogue from within that framework. He appeals to a specific point of cultural ignorance in which to inject gospel truth. Then in 17:28 he invokes a line from Aratus’ Phaenomena, a popular Greek poem. Paul engages with popular culture to meet the Athenians where they are with the truth of the person and work of Jesus Christ. In other contexts Paul reminds his readers that “all things are permissible, but not all things edify.”127 He challenges them to think on things that are worthy,128 and to speak only those things that are effective for meeting the need of the moment and for building up the house.129 The writer of Hebrews encourages believers to “consider how to stimulate one another to love and good deeds.”130 These are transformative teaching and learning activities, and they don’t involve integrating a Biblical approach with extra-biblical concepts, but rather undergirding our entire worldview on the words of Scripture. I would describe this as infusion versus refraction. Infusion (think of the process of brewing coffee) can be passive and distortive. One ingredient is received by another, resulting in a third product. Biblical thinking can be infused with secular psychology, integrated psychology, even Christian psychology, or Nouthetic psychology. But what we are after is refraction. Refraction can be active and corrective, allowing the observer to observe accurately. The Bible is the refractive lens through which to interpret and reinterpret all knowledge of the mind/soul. And before we can counsel Biblically, we must have an understanding of the Biblical psychology. This approach has the advantage of seeking to view all knowledge through the lens of Scripture, and to subject all knowledge to the authority of Scripture. It encourages science and research within the field of psychology. It offers a Biblical balance of description and prescription. Of course, if the Bible is unreliable, then the refractive power of Scripture is distortive rather than corrective, but the epistemological premise of the B+Ø approach is that God’s word is authoritative and sufficient for our understanding, for our equipping, and for our practice. There are many extra-biblical resources that we can employ, but in seeking out how and when to do that, we mustn’t lose sight of the one reliable constant that God has provided for us—the Bible. 106 Acts 20:31-32 (admonish and commend), Romans 15:14, 1 Corinthians 4:14, 10:11, and 2 Thessalonians 3:15. 107 Ephesians 6:4, Colossians 1:28, 3:16, 1 Thessalonians 5:12, 5:14, and Titus 3:10. 109 Job 1:22, 2:10, 40:3-5, 42:1-6. 112 Jay Adams, “Competent to Counsel: An Interview With Jay Adams,” Ligonier Ministries, Feb 1, 2014, viewed at https://www.ligonier.org/learn/articles/competent-counsel-interview-jay-adams/. 114 Jay Adams, “If You Love Me, Keep My Commandments,” Institute For Nouthetic Studies, Sept. 30, 2011, viewed at http://www.nouthetic.org/blog/?p=5169. 115 Christopher Cone, “Culinary Calvinism: Considering Jay Adams’ Tulipburger,” August 7, 2017, viewed at http://www.drcone.com/2017/08/07/culinary-calvinism-considering-jay-adams-tulipburger/. 116 Jay Adams, “Evangelism and Counseling,” Competent to Counsel: Introduction to Nouthetic Counseling, EPub Edition (Grand Rapids, MI: Zondervan, 2009). 117 Jay Adams, Godliness Through Discipline (Philipsburg, NJ: P&R Publishing, 1983), 2,3,5-6. 131 Jeff Forrey, “A Response to “The Integration of Christianity and Psychology: A Guest Post by Sarah Rainer,” Biblical Counseling Coalition, October 27, 2014, viewed at http://biblicalcounselingcoalition.org/2014/10/27/a-response-to-the-integration-of-christianity-and-psychology-a-guest-post-by-sarah-rainer/. Of this set of issues, Problem 3 is the only one that concerns me with the nouthetic approach. But I would add a Problem 5: rejection of non-organic mental illness (mental illness that is not attributable to a known physical condition). "Madness" is a Bible word (Deut. 28:28, Zech. 12:4, Prov. 26:18, Acts 26:25, etc.). I would add -- maybe this is #6, but not specific to nouthetic -- that "integration" does not have to be done the way it has been done in the past. Though biblical presuppositions can't be integrated with unbiblical ones, there is much in the study of psychology and mental health that doesn't rely on anti-biblical presuppositions. We need an approach that maintains the superior authority of Scripture and the study of theology but also accommodates (integrates) everything else true that may be known or discovered. ... but this is pretty close to the point of #3. It strikes me that Aaron's category #5 is coupled tightly with #2. If everything is sin, we have trouble coping with Job, not to mention organic mental illness like postpartum depression. It's worth noting as well that, whether fairly or unfairly, #2 is the chief criticism I've seen of nouthetic counseling. Thankfully, giving the Biblical category of "madness" and the example of Job, I think it is redeemable--unlike a number of schools of secular counseling, where experts in psychology will indeed tell their peers that they believe former heroes of that school are outright frauds. To Jeff's question. Have to be sketchy for now. Not good at keying in on a phone. In general, I think it should be pursued much as we do non-macroevolutionary biology and botany...with some similarities also to how we study medicine and how we study soft sciences like sociology and anthropology. So it starts with a high view of the Bible's authority and usefulness, lays a well developed theology of man on top of that, and these frame the rest of the effort. It's not so much discovering new things about "the human condition," per se, but about discovering more about human behavior, the human brain, and the many ways the curse expresses itself in the many ways humans stop thinking within normal ranges of soundness. A shift that's needed is toward more fully accepting "helping (mostly unregenerate) people improve their lives" as a vocation. If we don't look down on Christians who "merely" try to improve people's physical health, why should we look down on professions that aim to merely help people have better relationships, better cope with traumatic experiences, or even just feel happier? A Christian ice cream scooper works for the glory of God, but his/her work objective is to make people happier by selling them pure, cold, yummy happiness (which is --let's be honest-- what ice cream is!). And the couple of goals I mentioned are only a tiny sampling of the kinds of things the psychological professions aim to do. Sometimes in all the (appropriate) concern about eternal realities and sound theology and philosophy, we lose sight of simple things like this: helping people (however temporarily) is good work. I like this point. I think sometimes people look at Ephesians 5:18 as the only two choices for a human being - being controlled by wine (being drunk causes one to do things he would not normally do) or being controlled by the Spirit. But that isn't what that verse is teaching. Obviously, humans can be sober yet not Spirit-filled. "Good" people (Mother Teresa; any number of philanthropists) exist all over the place. They aren't righteous, but they do good things. They are generally happier than the "bad" people of the world. You raise a large topic, but this much should be pretty uncontroversial: in some way, it must always be better for sinners to do good than to do evil. We know it can't even begin to merit redemption, but there are other ways for "good" to still matter. Since I'm working with law enforcement literature every day now, my mind goes to crime and "behavioral health." Isn't it a blessing from God to John Doe if a 'shrink' working with an ex-con helps him refrain from robbing or attacking Mr. Doe?